Happy Thursday! I spent all day Wednesday shopping for plants to replace the ones that didn't survive the Fall planting we did when we put in new landscaping. I has happy to get them planted just before it rained last night, at least they got a good soaking! Also worked on getting the pool opened for the year. Off to DS's track meet, then came home to find some exciting news in my "in box", can't share that just yet though! With Mother's Day this weekend Kerry's 3CTC is a card for mom using Ribbon or Lace. I didn't have any lace in my stash of supplies, so I opted for ribbon. I mailed this card out to my mom for Mother's Day. I used the Out of the Box Technique for my focal image, cutting with my paper cutter. The sentiment is from JustRite Stampers Favorite Occasions Set and the 1-5/8" Wooden Stamper. I stamped the sentiment in Chocolate on Olive card stock, cut with my 1-3/8" Circle Punch, then layered it on a Rose Red Circle cut with the Spellbinders Circle Die. I used Spica Glitter Pens to add a bit of sparkle to the decoration near the sentiment. To see what the other Three Clover Challenge Team created today, click the logo on my sidebar. This is gorgeous Lisa!!! Looks like a photograph! OMG!!!!!!! I sat there an looking at your card forever. It looked to perfect to be stamped. Simply STUNNING! I must get these stamps. 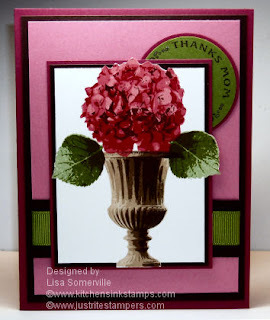 Gorgeous card Lisa. Love it! This is a very elegant card Lisa. Beautiful! The Hydrangea looks so real. LOVE LOVE LOVE this card!! It's soooo awesome! Fabulous! Your hydrangea is gorgeous!! The colors are beautiful, and are now written down in my stamping journal, in hopes that I can recreate it. I loved the lavender/purple one you did with the distress inks, too - I'll have to give that a go, too. Thanks for such awesome inspiration. Your mother will love her card! Wow this 3 step stamp looks 3D! I bet your Mom loved it!